The Museum of Design Atlanta has just opened up its “Designers, Makers, Users: 3D Printing the Future” exhibit, showcasing a huge array of important 3D printing projects. 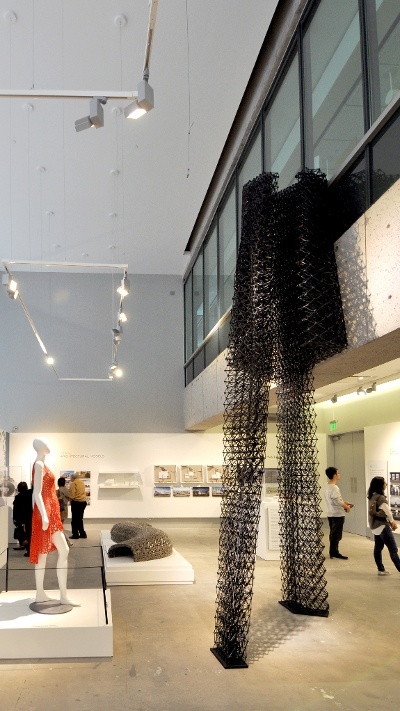 The show covers every type of technological breakthrough from 3D printing in space to bioprinting in people, so the largest 3D print in the US is more than fit for the exhibit, which is why Branch Technology was chosen to install an 18-foot-tall sculpture designed by architect Keith Kaseman of KBAS,. The sculpture, dubbed TN-01, sees the architect apply Branch Technology’s recently unveiled C-FAB 3D printing process. The piece is approximately 18 feet tall and has a volume of 54 cubic feet, 3D printed in separate pieces and assembled on site. While TN-01’s function is aesthetic in nature, the size of the piece demonstrates just what’s possible with the C-FAB process, in which a robotic arm is used to extrude plastic that acts as the basis for a building’s structural components. Because this skeleton is extremely light, it can be 3D printed and shipped to construction sites, where it would be sprayed with concrete and insulation before being assembled into a larger structure. The TN-01 will be on display at the MODA exhibit until January 10, 2016. In the mean time, it looks as though Branch is still hosting their design competition for the first house to be 3D printed with C-Fab. The winner receives $10,000 and gets to see their design brought into the physical world. From what I learned in my interview with Branch Technology, though, the firm will have to first ensure that their technology meets current construction standards before they can make the winning design a reality. With a volume of around 54 cubic feet, the structure was printed using a number of segments and then assembled on site. The work represents a pilot project for Branch's freeform 3D printing process. The design challenged and expanded upon Branch's printing capabilities while highlighting how technology can enable newpossibilities for designers. For those who are lucky enough to be in the Atlanta area, come check out the ground-breaking sculpture at MODA. The exhibit will remain on display from September 20, 2015 – January 10, 2016. For those who will miss it, we'll be posting some more pictures - it truly is something to see! For architects, artists and designers looking to bring their designs to life, at scale, click below and see what we can build together.